When you want long hair you don’t have to spend weeks and months growing it to the perfect length. With hair extensions you can change your look nearly as often as you change your clothes, allowing you to ring the changes as much as you like, with no mess and no fuss. Clip-in extensions are perfect for those times when you just fancy a change for a special occasion but when you want a whole new look then it’s time for a more permanent method of extending your locks. Thanks to a whole range of products, including pre-tipped extensions and high-quality human hair you can create a more lasting solution for your new hairstyle. Rather than relying on clips, bands or combs, permanent and semi-permanent extensions can be added to your own hair with a little help from some hair extension tools. It’s important to use quality trusted brands with that professional touch in order to ensure the best results. That’s why we only stock products which we consider to be of the highest standards and which offer our customers the best value.Our collection of hair extension tools includes glue guns for applying - or re-applying - glue tips to your hair extensions. 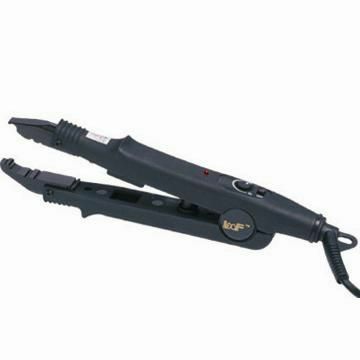 We also stock a selection of fusion irons to bond the extensions firmly and safely to your own hair. Because we provide hair extension tools to top salons around the country, we look for extra touches that provide added value. Longer than average cords won’t leave you hunting for a plug socket, and our hair tools are designed to be lightweight and comfortable to use.